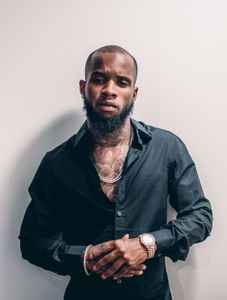 Daystar Peterson (born July 27, 1992), better known by his stage name Tory Lanez, is a Canadian rapper and singer. He received major recognition from the mixtape Lost Cause (2014) and the singles, "Say It," and "Luv", which peaked at number 23, and 19 on the Billboard Hot 100 respectively. In 2015, Tory Lanez signed to Mad Love Records and Interscope Records. Lanez released his debut studio album, I Told You on August 19, 2016. His sophomore album, Memories Don't Die was released on March 2, 2018. On October 26, 2018, Lanez released his third studio album, Love Me Now?. Daystar Peterson was born on July 27, 1992, in Toronto, Ontario, Canada, to a Barbadian father, Sonstar, and Curaçaoan mother, Luella. The family was based in Montreal, before moving to Miami, Florida.Daystar was known to practice and refine his rapping skills throughout his childhood, before tragically finding out that his mother had died due to a rare disease. Following his mother's death, his father began working as an ordained minister and missionary, causing them both to move frequently throughout the United States.Daystar's father later remarried and the family moved to Atlanta, Georgia, where Daystar met his friend Hakeem, who at the time was a janitor. Daystar's nickname "Lanez" was given to him by Hakeem, as a comment on Daystar's thrill seeking tendencies, that sometimes saw him mucking around in the street, not looking for traffic and playing in the lanes. In 2006, he was sent to live with older brother, Orane Forrest, in Jamaica, Queens, New York, because of his behavior issues. Daystar then was forced to return to Toronto with his grandmother. Since she refused to take care of him, he was on his own at the age of 15. "I ended up moving downtown with these three dudes that I didn’t really know. I came into the house and I didn’t realize how things worked. From like fifteen to eighteen, I was just fighting them. It was every man for himself. That’s what made me a man, having to fend for myself and being in a situation where there is no dad, no grandma and no mom to help you. It changed the person that I am today", he says. He then once again started rapping, before giving himself a nickname, Notorious (which is a reference to the late rapper Notorious B.I.G., whom he idolized), and adopted into his new moniker "Tory Lanez". At the age of 16, Daystar dropped out of the tenth grade, and he would begin performing songs at the outdoor concerts. At the age of 17, Daystar began singing, which he found an interest in. However, he had never received any vocal training. Daystar also goes by the name Argentina Fargo. In an interview, he said "When I put foreign and banking together, it’s like foreign money. I’m a Canadian dude, walking around America. When you look at me, it’s like looking at foreign money. So I call myself Argentina Fargo—like foreign money." Among his musical inspirations growing up Lanez cites Brandy and R. Kelly.